According to Coremetrics/IBM, 67% of online shoppers abandon their basket without proceeding to payment. Other reports show basket abandonment continues to remain high with figures of up to 75%. Whilst some of this is undoubtedly due to natural shopping behaviour and users not being ready to purchase, there are still many users abandoning due to unnecessary barriers and frustrations that cause users to exit before checkout. Many shoppers won’t be converted within their initial visit, regardless of changes you make on your site, but may return and convert higher if the return visit is made easier for them. Allow users to save individual items within their basket and provide an option to save the entire basket for later, so users know they can return and purchase without having to find items and add to bag again. This also encourages new visitors to provide their email address and set up a password that allows for email follow-ups and reminders. For those that abandon without saving items, store items from a previous visit and clearly make these visible on the site upon their return. Whilst this practice is now commonplace amongst large retailers it is often implemented only for users that login on their return visit. We recommend this feature is set-up so stored items are available for return visits from users that are not logged in as well. The majority of users won’t login until they are ready to checkout, and it’s a frustrating experience to re-add items to the shopping bag, only to find they are already stored there from a previous visit. Those retailers who’ll be most successful in the future will be those that recognise users and their browsing behaviour across devices and will be able to show items stored from a previous visit even when a user is returning using a different device from the one used on a previous visit. Many users abandon a purchase after a shopping basket is built because they just can’t make that final decision to purchase. So it’s important to aid decision making and allow users to change their mind from within the basket itself. Provide clear details on product availability from within basket. Firstly, confirm that the item is actually in stock and clearly state when saved items or items stored from a previous visit are no longer available before a user begins checkout. Stating when an item is low in stock (or ‘less than 10 available’ for example) may encourage some users to complete the purchase there and then, rather than waiting and returning later. 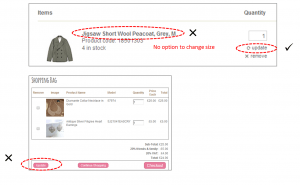 Allow users to easily change size and quantity from within basket. The ability to change the quantity and size of items, or remove them from within basket, are becoming common features on large retailer sites — and are starting to be expected by users. However, these are not always obvious or easy to use. When updating the quantity or size for example, users often overlook the ‘update basket’ click that confirms their new selection. Ideally, selecting a different size or changing quantity of items should dynamically update the basket. If the user is required to click ‘update’, ensure the update link or button is obvious and shown at a field level. Don’t have just one update button/link for the entire basket. Allow users to view and zoom product images from within the basket, along with a brief overview of the product details (including customer ratings, if possible), without the need to return to the product page. You should still provide a link to full product details for those that do want to return to the product page for this. Hidden costs and high delivery charges are often stated as two of the main reasons for users falling out of a checkout process, so it’s important to be upfront about these within the basket. Where possible, it’s essential to provide clear details on the different delivery options available, the costs for each option (especially flat-rate shipping costs), and estimated timescales from within the basket to avoid users abandoning checkout later due to costs being too high. If delivery options and costs are based on postcode/location, then provide functionality to allow users to check options and costs based on their location. Ideally, you’d also allow users to select the delivery option from within the basket so they can see the total price including delivery before checkout, with the option to easily change the delivery method, if required, during checkout. Outline the payment methods accepted from within basket to avoid users having to begin checkout to find out this information, or finding out during checkout that the payment method they wanted to use is not available. Also be upfront about any additional fees associated with any of the payment methods offered. For many users, the decision to purchase may depend upon the successful use of a promotional or discount code, so it’s incredibly frustrating for users to be forced through to checkout before being able to apply a promotional code. Include the ability to apply one or more promotional codes from within the basket so that users can check that the code works correctly and see the total price, including any discounts, before checkout. Also allow users to apply promotional codes later in the checkout process, too, in case they miss it here. Many sites provide a generic ‘code is invalid’ message for codes that are not working. 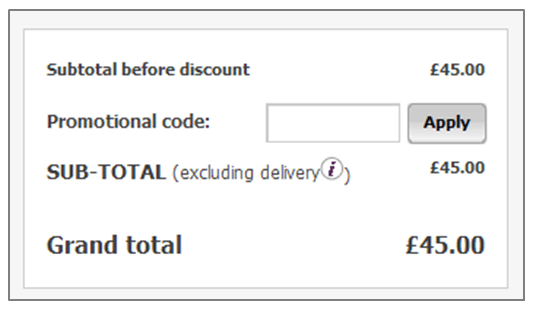 Instead, try to be more specific to help the user move forward: e.g.. ‘This code has expired’, ‘This code is not recognised’, ‘This promotion is not valid based on your basket contents/value…..’, ‘you need to spend over £50 to receive free delivery using this code’ and so on. Along with stating clear delivery options and costs within the basket, provide obvious links to further details on the different delivery options available and the returns policy in particular, along with any FAQs associated with these areas. Concerns about payment security are some of the top reasons for basket abandonment. Within basket and during the checkout process it’s important to outline the security checks in place and clearly show any security certificates. This gives shoppers confidence that their transaction will be secure with you. It’s also important to continue to track and monitor what visitors are doing on your site, which ones are falling out of the checkout process and why. This information enables you to continually make site and process improvements and thereby increase sales conversion. A great way of doing this is to implement session replay technology on your site. A good session replay tool should allow you to monitor the checkout conversion funnel and understand where visitors are falling out of the process at both a page and field level. It will also allow you to record and play back real customer sessions to help identify and improve any usability or technical issues encountered by users.